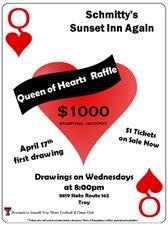 Queen of Hearts Raffle starting Wednesday April 17th. Starting pot is $1000. $1 per ticket and can buy them all week long at Schmitty's Sunset Inn Again, Troy IL. 8:00pm drawing 7:45pm ticket sales will cease. Proceeds to benefit Troy Titans Football and Cheer Club.